70 square meters, parking, underground, central, WIFI, up to 6 pers. 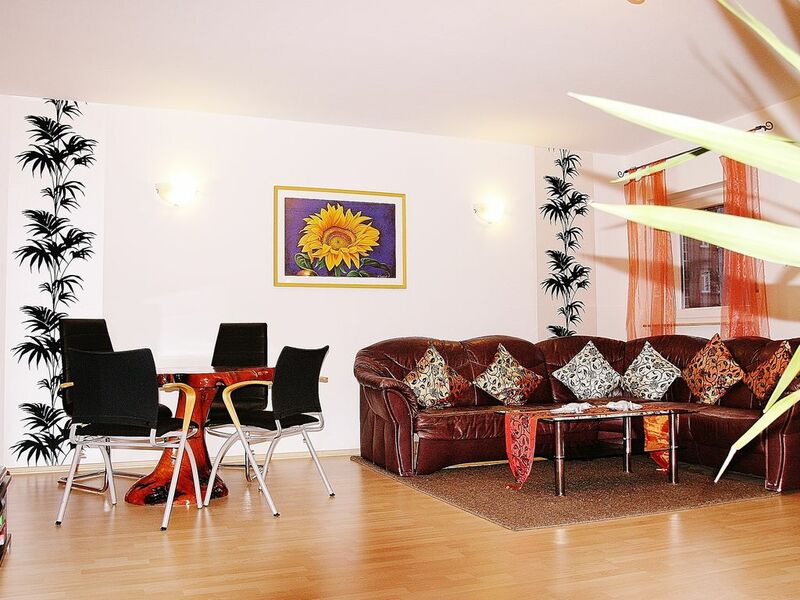 Company, Business, Family ..
Modern, opened in May 2011neu apartment at the central location in Nuremberg, only 1 min. To the nearest metro. There is a sun-flooded 67sqm large and elegant modern finely decorated apartment on the mezzanine floor. A spacious bathroom with windows, and a separate toilet are available. Our more than spacious living room to use with Wi-Fi connection, cable TV and the exclusive work area, eg. As well as a holiday island for a dinner with candlelight. At the closed backyard, you can park your car comfortably and safely. NEW in our kitchen: A moderener Kaffeevollautomaten, well stocked with the best coffee beans. From 3 nights you get when our guests also a small selection of Franconian beers. From 7 nights there is a bottle of white wine, and a wide range of fine Franconian beers for free. Business: Quiet but centrally located. Whether you want to take the metro or by car to your goals. With the subway you are with only one stop at Plaerrer, right in the heart of Nuremberg. With the car you drive within a few minutes directly to the castle. The highways Frankenschnellweg in only 3 - 4 min., Südwesttangente can also be reached in less than 2 kilometers away. Your car can be parked safely in our locked backyard. Elegant PC workstation in the living room. CD stereo with USB port. Leather sofa (only partially available when used as a sofa bed). Holiday: In the middle of the city, in a tranquil stay for up to 5 people. If arriving by car accounted annoying long way with the suitcases, because you park right in the backyard. Few stairs & you're with all the utensils in your holiday home, conveniently located on the mezzanine floor. By car you can reach out of town on the road Rothenburger the Playmobil Fun Park in 15 minutes., More trips near the Fun Park is the 'pony farm Raitersaich'. The city of Nuremberg, offers with the Imperial Castle, the main market (Christmas Market in December) and the documentary center at the former Nazi party rally grounds, you can find out about the recent inglorious history of Nuremberg. Even the Nuremberg Zoo, Wöhrder See and the Wöhrder Wiese invite you to relax. Excursions in the Franconian Lake District, as the Rothsee u. The Brombachsee are within easy reach via the motorway. We are only 200 meters. From the Rothenburger Str. Getting there:. By car on the Frankenschnellweg, exit Rothenburg street in less than 3 minutes to get to your holiday Westside Living. About Südwesttangente, exit Stein or Gebersdorf You can reach us also in just 5 min. Drive away.
. If you arrive by train in Nuremberg main station, you can easily take the subway a few stops directly to your apartment Westside Living - 1 min (100 meters) on foot. On request, we can also be happy at the main station.-Nürnberg Or at the underground station St. Leonhard pick - please contact us for this purpose at least 24 hours in advance..! Non-allergenic pillows and blankets in the bedroom. High-quality pocket spring mattress up. 150 kg / person, with adjustable slats. All rooms with parquet / laminate or tiled floor. Kitchen with dishwasher and ceramic hob. Spices, coffee, - and espresso machine, incl. Espresso and coffee powder, Vegetable oil, honey, 2 L of mineral water incl. ! Non smoking property! We stayed in this apartment for 2 nights while enjoying the Nuremberg Christmas market and sights. Jürgen met us at the apartment, gave us an orientation and some very helpful info about getting around, where to eat things to see, etc. The apartment is a great location, just a 2 minute walk to u-bahn, bakery, grocery and fruit market. The apartment is very comfortable and the kitchen well provisioned. Internet worked great and it was nice to catch up on the news on the tv. Very quiet, safe neighborhood, yet very close to all the sights. Could not have asked for a nicer accommodation. Due to previous renters, we were unable to stay here. Thankfully, Ann was able to find us another rental. The new place was awesome! It was perfectly located to walk to the Old City and great restaurants. I can't thank Ann enough! If I had anything negative to say it would be that during the unusually hot weather Nurnberg was having, the place did not have AC nor fans. Our brief stay in Nuremberg was fabulous, thanks to this apartment! The apartment was spotlessly clean with ample room for all of us. The coffee machine was a welcome pick-me-up in the morning. We arrived late due to terrible traffic, but Ann and Jurgen graciously welcomed us and made us feel instantly at home. I have never met kinder hosts. We would definitely choose to stay here again! The owners were very helpful and flexible. The apartment was very comfortable, clean and the extras that the apartment comes with...wine, bottle of water, coffee maker that includes the bean! We can't say enough good things about the apartment. The location was very convenient to the tram and a quick ride to the sites. We definitely recommend this apartment! We stayed here December 2013 and had a fantastic time. The apartment was plenty big for the 2 of us. It is super convenient to the U-Bahn (which is very easy to use). There are shops a short walk away including a grocery store. It was nice to be able to park our car and know it was safe. Highly recommend the Italian restaurant up the street called Dolce & Gelato. If you want to visit Nuremberg this is the place to stay. The apartment is as described & had everything that we two needed for a wonderful 4 day stay in Nuremberg. The apartment is well presented, very clean & the reception from from both Ann & Juergen was outstanding & very definitely helped to make our stay. Would we like to return to Nuremberg? Yes! Would we stay at this apartment? Definitely!! Near Old Town, practical accessibility of the Playmobil Fun Park, Imperial Castle, Plärrer, fair and main railway station to reach quick and convenient with the subway. Metro Station St. Leonhard be reached in 1 min.. Parking space in the enclosed courtyard available. In addition to the fun park, there is the popular 'Pony farm Raitersaich' only about 10 Km from FunPark away. Also reachable by tram.